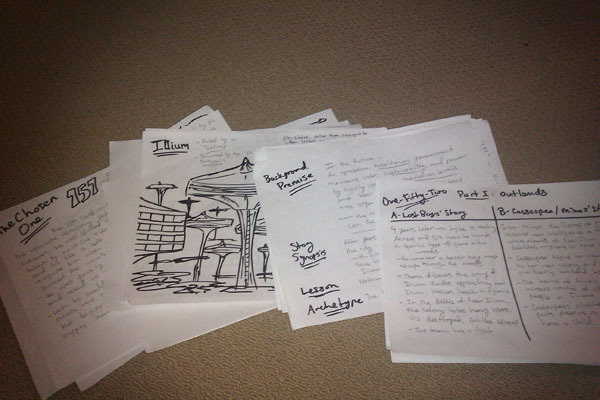 The fifth post in my "Writing a Novel Series", which details my experience writing 151, describes how I took the outline written out for the first book in the series and began to paint in the details that I would need in order to write the story. First, I got in touch with my inner artist and began to sketch out my vision of the world. From the tall, arching towers that would house the Colonies, to the dreary and fog-ridden city Underground, to the sleek insides of the Colony itself, I wanted to paint a picture—even if a crudely drawn one—of what this world might look like. And even though I sometimes struggled to create images that I was truly happy with, there's no doubt that these sketches and drawings helped me when I was ultimately describing the locations in the novel. Beyond the look, I also needed to solidify the history and lore of the world, even if some of those details would never fully be revealed to the reader. I had to understand what the world was like before, how it became this way, and why the people put up with it the way they did. I had to understand how conflicts and new orders led to the system as it is, and what kind of beliefs the people living within it would have grown to have. All that brainstorming would ultimately lead to a richer and more compelling story. This process, although difficult, took the character archetypes that I had developed earlier on and added some much-needed meat. Each character's map included a rough sketch of what the character might look like, an outline of their archetype, a brief background on their history, and the role that they would play in the story. Finally, I added a detail that would become a fundamental driving force of how each character would act and behave during the entire course of the novel: their yearning. Now that the details have been painted, is it time to write yet?? ?